I added the following jars in jarplice: derby.jar, commons-io-2.6.jar and org.json.jar the fat jar file it produced didn't work. Is there any chance that you would be able to implement the ability to use icons in the Windows EXE tab? Thank you for adding this! I just noticed today that jarsplice doesn't have that feature, and find it lucky that someone added command line parameters to a forgotten relic so recently. Why including "sqlite-jdbc-3.8.11.2" doesn't work? as when I tried to do so it didn't show me an error, however, it's not working. As you can see i'm using 3rd party apache lib but its not duplicate. what am i doing wrong? JarSplice doesn't open at all. I manually chose it to open with Java but it closes as soon as it opens. Can you help? open the command prompt, go to the folder containing the jar and run it using "java -jar JarSplice-0.40.jar". If it still doesn't run, please post the error that appears. I was going to ask for an option to support drag/drag but looks like this project is no longer active. 2) Will you ever fix command line parameter support? 3) If answered yes to 1 and 2, can you release the source code so that someone else can fix command line parameter support? 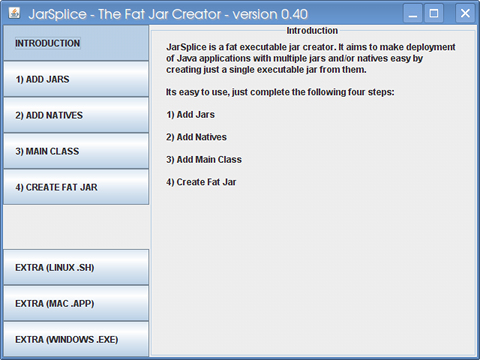 Hi, while I create fat jar with jarsplice, I have got an error that is "Jar creation failed due to the following exception: duplicate entry:about.html"
check that your jars do not have duplicate entries, i.e. files with the same names, otherwise you can't merge them into one jar. Please fix command line parameters! (I know many people have already asked). Also, when using a command line program in the terminal in Ubuntu, the enter button does not work to enter something with a Scanner or BufferedReader. It works with just the plain jar. if I do all this and open the .jar it shows the screen for less than 1 second. what do i do wrong? any can tell me what are native files? Hi Im using on Jruby FatJar GUI packaging and when i setup a splash like a normal jar it remains after class launches appears i think that is because jarsplice reaminds. I can solve it using vm parameters but it need and stand alone splash image file near fatjar. ¿Theres a way to put splash onto jar and do they die after charge, another manifest option? It seems that JarSplice lost its ability to create .app files, probably due to my upgrade to Java7. Are there plans to patch this. It is a REALLY useful ability to have. could you please add support for command line parameters? That would be so <---------------------------------------------> great! Does JarSplice support Java 7? Great tool, works exceptionally well. It would be useful, though, if there was support to adding application icons for *.exe as with the Mac OS App Bundle. Something nice to have. It would be great if one could add additional folders or files, so really all project files are in one jar. Awesome project by the way. This is an awsome tool, takes the hustle of adding libs and natives away, butI am unable to pass program arguments and also it seems the Scanner class which allows to take input from Console gets disabled . My JAR file prompts user for input when run openly but does not show console input prompt when packaged through jarSplice. But is it possible to have icons for .exe export? I modified JarSplice a month or so ago so that i could call it via cli from a build script, I contacted the author about the change however he has not responded so i might aswell release it here seeing as other people had requested it. If you compile the above file as JarSplice.java (you will need to add the jarsplice jar to your classpath or extract the jarsplice jar and place it in org/ninjacave/jarsplice). Once compiled open the original jarsplice jar in a program such as 7z and replace the JarSplice.class in the dir structure org/ninjacave/jarsplice. Now you should be able to execute jarsplice as usual or with a CLI (just call it from command line with a random argument and it should list the correct usage). I have only tested it for adding jars to jars but all functionality of the original application should be accessible through the CLI. For anyone unable to complete the above steps i have provided a premodified version, however you are encouraged to use the above source code modification. I think there needs to be an option to save/load projects. did you export as a jar or an executable jar? Open up your jar files and see if there is a manifest file already created. they have META-INF folder and MANIFEST.MF file in it . Do you mean that ? how did you solve that ? This is what I've been looking for! Even though my app only had one jar, this allowed me to set Xms and Xmx options without dealing with command lines. If i use your utility to create one single jar, will the jarsigner tool work to sign all jars within the created jar? I try to package my jar with your application, i added 2 jar for my database : derby.jar and derbyclient.jar (10.8.1.2). I found a way not to have to put all dependencies every time you want to make a fat jar. 2 You also must use the libraries as maven dependencies, and not as your ide adds them. 2.1 If you use LWJGL and/or Slick 2D, I strongly recommend that you use the Maven Native Dependencies plugin, it has all the natives for both this libraries. That's all the preparation, now let's go to making our Jar. 3 Make sure your project doesn't have any error and that it compiles successfully. 4 Use the assembly plugin's assembly:assembly goal to make a jar with it's dependencies. 5 Add the Jar with dependencies and the main-class to JarSplice. That should be all you ought to do. The Fat Jar JarSplice makes should be fully executable. The next time you want to make a fat Jar you just have to start from the 3rd step. This way, Maven deals with adding all the dependencies, and you just have to define which is the main class. PS: If someone knows how to make Maven put the Main class with all this plugins, send me a mail to aritzjava@gmail.com because I haven't managed to do it. Command line argument passing would be great for automated build processing. For example, arguments containing locations for the jars, natives, main class, and output could be passed to the VM and automatically dealt with as an alternative to using the GUI each and every time a distributable jar in need of being generated using this tool. I would have done this myself, but it doesn't appear as though the source is available. Command Line support will be part of the next release, source should follow shortly after that. Where's the BSD licensed source? Can you please add ability to save/load all settings, so when I want to recompile just press Create Fat Jar button and it's done? What do you add as your main class path? The main class (and package) of your application!